My very gracious husband has learned that if we have late-night company, I will not be going to bed until the leftovers are put away, the dishes are in the dishwasher, and the extra chairs are taken back downstairs. Of course, there is the occasional exception, such as last night’s family sleepover when ice cream bowls got left in the sink. However, these exceptions are few and far between, and cleaning the kitchen has gained a permanent abode in my evening routine. Nevertheless, as clean as my kitchen may be at the end of the day, it never changes the fact that a hundred other things remain lingering in my mind, heavy on my heart, and (still) on my to-do list when my head finally hits the pillow. I shouldn’t have reacted that way with my children today. I’m sorry, Lord. Please help me to grow in patience. What were those three items I thought of earlier that need to be added to the grocery list? The list goes on—character traits lacking in my children, a difficult decision to make with my husband, and endless meals to plan, shop for, and prepare. Of course, I could glue my eyelids to my brow and work on just one more thing. But I’m tired. And though the recipe hasn’t been found, the appointment made, the prayer request answered, or the schedule tweaked, I turn off the lights, close my eyes, and sleep. Sometimes, one of the hardest decisions of the day is when to end it. Whether we are full-time college students, stay-at-home mothers of young children, or older women looking out for wayward teenagers, life is constantly presenting new challenges and choices, trials and tasks. And sometimes they all seem to pile one on top of the other, no matter how hard we work to address every nook and cranny of life. Never does the day come when the present is finally perfected and the future permanently fixed. What is a weary woman to do? Continue working diligently? Yes. Ask godly men and women for insight and suggestions? Yes. Cry out in fervent prayer to the Lord’s help? Yes! Go to bed and sleep peacefully? It is in vain that you rise up early and go late to rest, eating the bread of anxious toil; for he gives to his beloved sleep (Ps. 127:2). 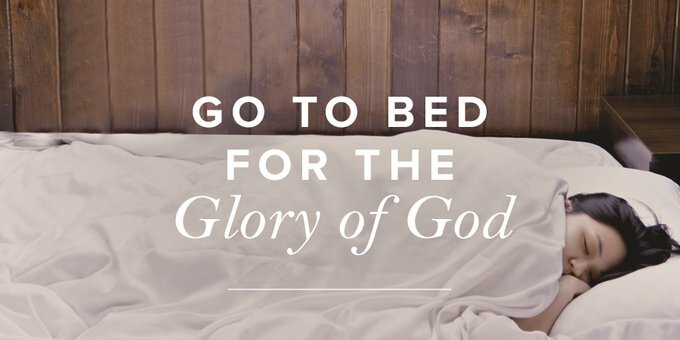 Has it ever occurred to you that going to bed can glorify God? He created us to need sleep and He graciously gives it. Therefore, we can please Him by acknowledging this need and accepting the gift with gratitude. 1. Sleep acknowledges my limitations. I may stay in bed because I am lazy, but I go to bed because I am limited—a fallen, finite creature with a body and mind that must rest in order to thrive. Sleep is a daily reminder from God that we are not God. “He who keeps Israel will neither slumber nor sleep” (Ps. 121:4). But we will. For we are not God. Once a day God sends us to bed like patients with a sickness. The sickness is a chronic tendency to think we are in control and that our work is indispensable (pg. 336). As hard as it may be to admit it at times, I am a finite creature who is only able to do anything because of the grace of God. He gives the health and energy to manage my home and care for my children. He gives me the wisdom to deal with my son’s disobedience. He provides the working vehicle so I can go to the grocery store. He graciously grants me the time to work on a project while He causes my children to nap. The tiniest task, the smallest success, the most difficult dilemma—every part of every day and every week and every year is governed and granted by the God of the universe. And lest we forget this, He lovingly reminds us every night when we tiredly walk away from problems, projects, and possibilities, and entrust ourselves to our sovereign Creator, who gives us sleep. 2. Sleep prepares me for tomorrow. In this current season of life, my primary work is wife, mother of two toddlers, and keeper of the home. Whether you are a mother, wife, student, sister, or employee, God has given you work to do; and whether we are cleaning, studying, disciplining, or discipling, our work requires much from us. Cleaning my home requires physical strength. Writing a blog post requires mental strength. Being patient with my four-year-old requires emotional strength. And doing all of these things in a way that pleases the Lord, day in and day out, requires ever-increasing spiritual strength. Getting a good night’s sleep is a way I can prepare my body, mind, heart, and soul for the work God has given me to do the following day (or in the middle of the night!). My body and mind are helped by the sleep, and my heart and soul are helped when I am able to wake up early the next morning and spend time with the Lord. 3. Sleep helps me to redeem the time. Modern technology has opened up a world of endless entertainment and information to us, making it very easy for us to waste time on things that do not line up with our priorities or help and edify our souls. A simple search on Google can turn into an hour of unproductive browsing. Our desire for some relaxation can turn into two hours of mindlessly sitting in front of the television watching reruns. Sometimes the best way to make the greatest use of the time is to shut the computer, turn off the TV, silence the phone, and go to bed. For example, I may need to find a recipe for the potluck next weekend, but if it comes to the point where I’m sleepily scrolling through Pinterest for an hour trying to find the “perfect” one, it’s time to step back, remind myself of my priorities, and use a recipe I already have! Of course, just as with any other earthly gift, sleep can be abused and distorted. The Bible clearly commands us to not be lazy, selfish, or spiritually sluggish, as does it exhort us to manage our time well (Eph. 5:16) and work with cheerful diligence (Prov. 31:11–15). And there are times when we glorify God by denying ourselves sleep in order to serve others (such as nursing a baby) or seek the Lord in prayer during a time of spiritual warfare. But just because there is a risk of misusing the gift, does not mean we should despise or avoid it. Rather, we go to God and ask for humility to accept it joyfully and wisdom to use it rightly. May we learn to lie down and sleep in peace (Ps. 4:8), ever grateful that we serve a sovereign God who does not slumber and yet glorifies Himself when His beloved children do. Tessa is a stay-at-home mama living in Grand Rapids, Michigan with her husband Nick and their two little boys. A few of her passions are biblical womanhood, God-glorifying homemaking, learning to apply Scripture to everyday life, and writing about the truths the Lord is teaching her.